That was the observation of social expert, Dr Rick Muir, when he addressed a meeting held as part of the Pig’s Ear festival on 4 December. Dr Muir is author of the recent Institute of Public Policy Research report, Pubs and places: The social value of community pubs. This article first appeared in the London Drinker Winter 2010 edition. 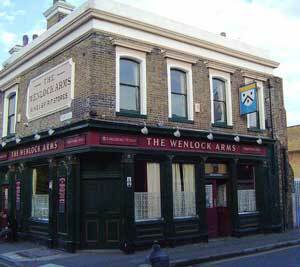 The Wenlock Arms has been awarded CAMRA’s London Cider Pub of the Year . This pub is a real drinkers pub, nothing too posh, just proper well kept beer and more importantly cider. Ian White, CAMRA’s London Cider and Perry Coordinator, said the pub has a continual commitment to cider. The pub, in Wenlock Street, Angel, also runs an annual beer and cider festival in conjunction with the local North London Branch of CAMRA during a cider and perry month in October. This gives locals a chance to taste something different and see why CAMRA is making such a fuss about the real stuff. The Wenlock Arms is a traditional corner pub, which takes its name from the defunct Wenlock Brewery that was once nearby. It’s also famous for its doorstop sandwiches that help soak up its cider and its extensive range of real ales. When I visited they were recovering from a 3 day beer festival where they had 3 real ciders on. The cellar man said that had ‘gone down well’, and also ‘that there were 15 people waiting outside at opening time!’. Both good signs that real cider is getting the attention is rightly deserves, putting cider firmly on the map in the capital. Bringing attention to the producers and enjoyment of a traditionally crafted drink. On a normal day you will find Thatchers Gold Cider and maybe a barrel left over from a festival (which I did). There is no food apart from sandwiches and pasties, a good sign that it’s all about the drinking. Congratulations to all the staff on the Wenlock! View our list of Cider pubs in London, or Google map of London pubs. The competition for the Cider & Perry Pub of the Year is now underway has been announced. 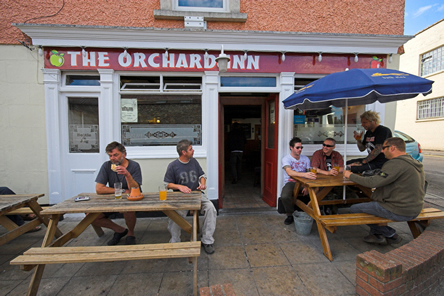 The first pub to be announced is ‘The Orchard’, Bristol that wins CAMRA Cider pub of the year (South-West). A prestigious award for any pub, the orchard has won the award for consistently serving a excellent selection of #realcider. Enjoyed by a variety of regulars and newcomers. From recent reviews, varying from 8 – 13 different ciders at any time. Bristol is a fantastic place to enjoy cider at any time of year, view our list of cider pubs in the city, or view a map to the Orchard Pub.